Though the profile of NCAA golf continues to grow through docuseries and televised tournaments, golf remains one of the most exclusive opportunities in the college sports landscape. According to the NCAA, roughly 75,000 girls play high school golf, but only 5,000 (7%) have the opportunity to play in college. Of all the sports offered at the NCAA level only ice hockey and field hockey have fewer total participants in women’s collegiate sports than golf. Golf is even more exclusive on the men’s side. 141,000 boys participate in high school golf, but only 8,500 (6.5%) play in college. In terms of total participation, golf has the 6th smallest numbers (greater than only ice hockey, water polo, volleyball, wrestling and tennis). Opportunity may be limited, but interest is not. College golf has grown into a marketable property. Top flight universities boast five-star facilities. As more and more money pours into professional golf, college golf will become an increasingly popular pathway for athletes to pursue their dreams of becoming a professional athlete, paying for college, or enriching their experience. Golf will always be a game of skill, but what happens when more explosive athletes become the more skilled? Take wunderkind Matthew Wolff of Oklahoma State. As George Gankas says, he’s going to be a disruptor. Obviously, Wolff is just one example, but it's an excuse to post one of the most fun swings in golf. 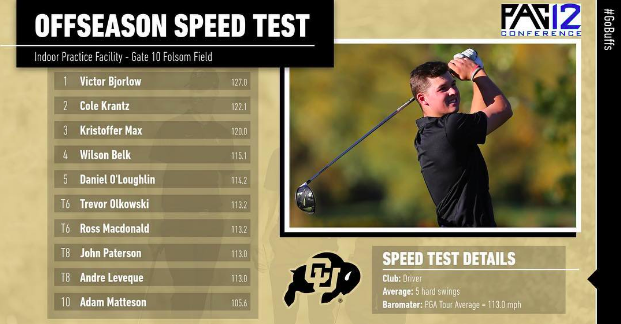 College golf teams post speed numbers the way football teams post 40 times. Check out Colorado’s leaderboard. Nine of their 10 players are at or above the PGA TOUR average of 113 mph. Speed is a skill and something that the best programs train. Golf Channel's Driven featuring the Oklahoma and Oklahoma State men's programs was widely acclaimed, but our favorite episode featured how both programs trained. In a survey of 91 NCAA and NAIA coaches by Brendan Ryan of Golf Placement Services, 92% have made fitness a mandatory part of their program, 97% believe that fitness is an important part of a player’s development and success and 89% of coaches believe that players are hitting the ball further because of fitness. 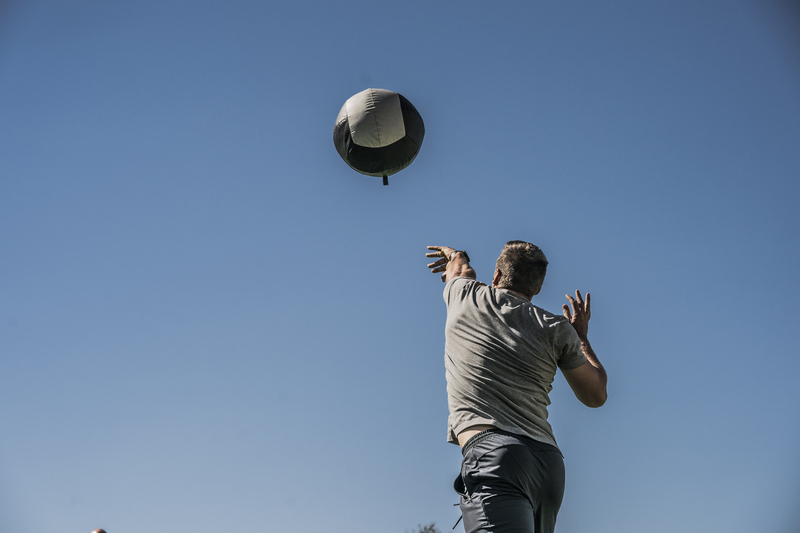 If you want to play in college, fitness isn’t a recommendation, it’s an expectation. Anyone involved with elite junior golf will tell you, the kids are good. Jamie Mulligan, who has coached TOUR players for over 20 years, mentioned at the 2019 Open Forum that every generation is better than the next. Performances that were elite 20 years ago aren't nearly as competitive today. "The bar is getting raised every day, I’m seeing the next generation of women getting more athletic, which helps with the speed component but also with the ability to make changes quicker in their individual coaching programs." The stats support Joey's observation. The best player in 2009 according to Golfstat Cup was Jennifer Song of USC with a scoring average of 71.55. After the fall, in 2018, according to Golfstat, the best player in women’s college golf was Patty Tavatanakit with a stroke average of 68; 3.55 shots better. The 2009 National Championship in women’s golf was won by Arizona State at Caves Valley County Club with a winning score of 1,182 over four rounds or 295.5 average per round. In the fall of 2018, according to Golfstat, the number 1 team in the country was University of Southern California with a scoring average of 284.5; 11 shots better than the 2009 champions. In 1997-98 according to Golfstat, the official rankings of college golf, the number one player in college golf was Jenny Chuasiriporn was a stroke average of 72.94 for the dominate Duke University Blue Devils. According to research by the author, 20 years later, the average Division I recruit has a junior scoring differential of .93, which would equal approximately a scoring average of 72.93. This means in 20 years, the best player in college golf has become simply an average Division I recruit. College golf is a tremendous experience and opportunity for thousands of kids. While there will be a variety of swing speeds, swing styles and training strategies, the trends are difficult to ignore. College golf is getting faster, stronger and better.